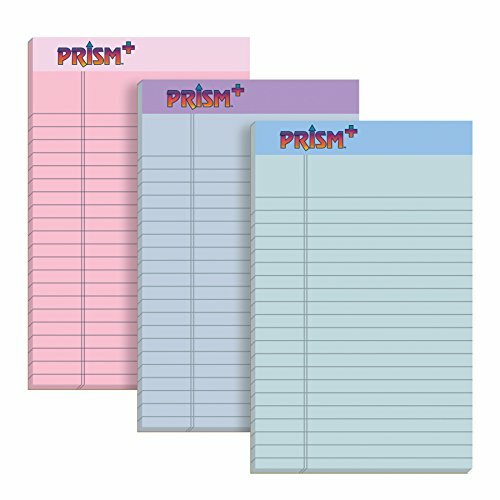 TOPS Prism+ Writing Pads brighten the office with soft-colored papers and bindings to match. This smaller, portable size is ideal for quick notes & meetings. Smooth Prism+ paper is a pleasure to write on; even basic ballpoint pens and gel pens glide across the page. Our paper is made from 100% recycled fiber with at least 30% post-consumer fiber. A sturdy back provides firm writing support for taking notes on the go. You'll keep a tidy notepad with the help of micro perforated sheets that detach easily when you're ready to remove a page to revise. Get color, quality and value in one package. Proudly made in the USA. Assorted Colors: two each, pink, orchid, blue. 5"" x 8"", Jr. legal ruled. 50 Sheets. 6 Pack. Colorful You: Prism+ paper comes in subtle shades to add a touch of color to your day; make your writing pads stand out from the crowd, or color code them by project, meeting or class so you'll always know which notepad to grab. The Perfect Fit: Jr. Legal 5 x 8 writing pads are more convenient than a full notebook; the size is perfect for jotting down notes and managing lists; they're small enough to use as a message pad by the phone and portable enough to take from desk to bag to car. Cute and Practical: Leave a pretty note in a card or drop a cheery hello on a friend's desk; a little color comes in handy and looks more personal and tasteful than a plain white or bland canary page. Proudly Made in the USA: Every TOPS Prism Writing Pad is sourced, made and manufactured in the USA; a standard of quality you can rely on. Manufacturer: TOPS Business Forms, Inc. Publisher: TOPS Business Forms, Inc. Studio: TOPS Business Forms, Inc.